With recent government approval of potatoes that don't bruise and apples that don't brown, a new generation of genetically modified foods is headed to grocery shelves. What could be next? Cancer-fighting pink pineapples, heart-healthy purple tomatoes and less fatty vegetable oils, among other products, could receive government approval in the coming years. The companies and scientists that have created these foods are hoping that customers will be attracted to the health benefits and convenience and overlook any concerns about genetic engineering. "I think once people see more of the benefits they will become more accepting of the technology," says Michael Firko, who oversees the Agriculture Department's regulation of genetically modified organisms, or GMOs. Critics aren't so sure. They say there should be more thorough regulation of modified foods, which are grown from seeds engineered in labs. The Agriculture Department has the authority only to oversee plant health relative to GMOs, and seeking Food and Drug Administration's safety approval is generally voluntary. "Many of these things can be done through traditional breeding," says Doug Gurian-Sherman of the advocacy group Center for Food Safety. "There needs to be skepticism." Fresh Del Monte Produce Inc. has engineered a pink pineapple that includes lycopene, an antioxidant compound that gives tomatoes their red color and may have a role in preventing cancer. USDA has approved importation of the pineapple, which would be grown only outside of the United States; it is pending FDA approval. Some gardeners already grow conventional purple tomatoes, but a small British company is planning to apply for U.S. permission to produce and sell a new genetically modified variety that have high levels of anthocyanins, compounds found in blueberries that some studies show lower the risk of cardiovascular disease and cancer. FDA would have to approve any health claims used to sell the products. Seed giants Monsanto and Dow AgroSciences are separately developing modified soybean, canola and sunflower oils with fewer saturated fats and more Omega-3 fatty acids. 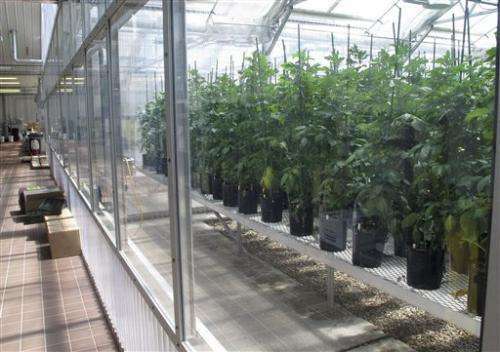 The Florida citrus company Southern Gardens is using a spinach gene to develop genetically engineered orange trees that could potentially resist citrus greening disease, which is devastating the Florida orange crop. 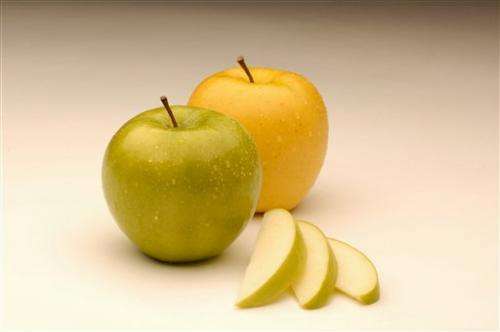 Okanagan Specialty Fruits Inc., the company that created the nonbrowning apples, is also looking at genetically engineering peaches, cherries and pears to resist disease and improve quality. A few genetically engineered fruits and vegetables are already available in grocery stores: Hawaiian papaya, some zucchini and squash and a small amount of the sweet corn we eat, for example. But the bulk of the nation's genetically engineered crops are corn and soybeans that are eaten by livestock or made into popular processed food ingredients like corn starch, soybean oil or high fructose corn syrup. The engineered corn and soybeans have faced resistance from environmental groups and some consumers who say not enough is known about the technology. The FDA has said engineered foods on the market now are safe, but the groups have called for the labeling so consumers know what they are eating. According to a December Associated Press-GfK poll, two-thirds of Americans favor those labels. Facing that concern, companies developing the new products say their strategy for winning over consumers is to harness the increased interest in healthy eating. "This is a new wave of crops that have both grower benefits and consumer benefits," says Doug Cole of J.R. Simplot, the company that developed the potatoes. Many modified types of corn and soybeans are engineered to resist herbicides, which is of little use to the consumer. A potential benefit of Simplot's potatoes is fewer black spots, a plus not only for farmers seeking higher yields but also for consumers who wouldn't have to soak them before cooking. 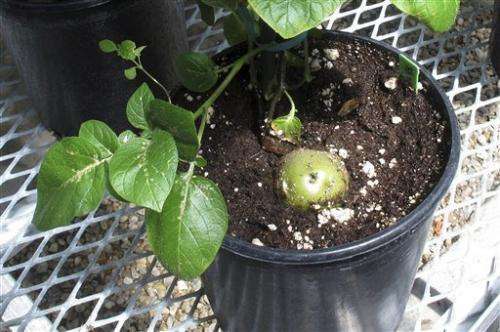 Small amounts of both the potatoes and the apples could be in stores in the next two or three years. 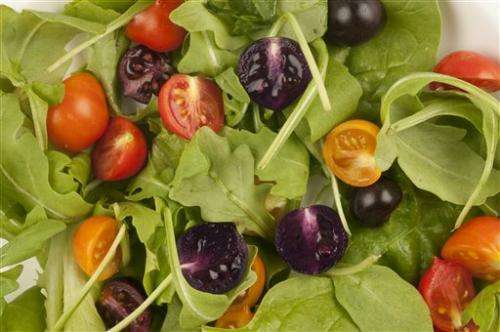 British scientist Cathie Martin has developed the modified purple tomatoes and hopes to eventually sell them as a juice in the United States. She says some of those same health-conscious consumers concerned about GMOs should be attracted to a product with potential to help lower the risk of cancer. Retailers are still uncertain. McDonald's buys Simplot's conventional potato products but said the company does not have "current plans" to source any GMO potatoes. Other retail chains have already pledged not to sell a genetically engineered salmon that is pending approval at the Food and Drug Administration. Cathleen Enright of the Biotechnology Industry Organization says the industry worries that opposition from advocacy groups will slow development. "At the end of the day, the marketplace is going to determine what is going to succeed," Enright said.